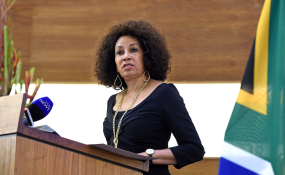 South Africa stands ready to assist Zimbabwe so that the reforms it is implementing to turn around the economy succeed, South Africa's International Relations and Co-operation Minister Lindiwe Sisulu has said. Zimbabwe is implementing a new economic blueprint, the Transitional Stabilisation Programme, to turnaround its economic fortunes. "As and when Zimbabwe requests our support in anything, we will be able to provide them with that support, fully. We wish the people of Zimbabwe well. It's a country that we regard as a friend, and we would like some stability there. We would like the economic reforms that have been put in place to succeed there," said Minister Sisulu. "Insofar as Zimbabwe is concerned, we stand very ready at all times to assist the people of Zimbabwe. We have had a very long-standing relationship with the people of Zimbabwe from the time we were in the struggle," she said. "At any time they need our assistance, they are able to request our assistance. We would not be able to go to Zimbabwe and say here is a bag of whatever and you will have it. I think international relations depends on reciprocity," Minister Sisulu said. South Africa is Zimbabwe's largest trading partner and the two nations share a rich history that predates colonialism. Over 169 000 Zimbabweans are set to benefit from South Africa's Zimbabwe Exemption Permits allowing them to stay in the neighbouring country up to 2021. Upon his assumption of Office as the Head of State and Government in November last year, President Mnangagwa's first foreign visit was to South Africa. On the sidelines of that summit, he held bilateral talks with President Ramaphosa in a show of close ties between the two countries.-- Bulawayo Bureau-Herald Reporter.